Question: Why do the descents make a much bigger impression in our sensations than the ascents? Answer: It’s because we are egoists. We were created out of the will to enjoy, which experiences pleasure or suffering. There is no middle between them, and therefore even when I am in a neutral state where both pleasure and suffering are absent, I feel bad. I lack pleasure. I always demand a positive; zero is not enough for me. That is why a person is dissatisfied. He has a home, a job, and plenty of food, but something is still missing. Either the grass is greener on his neighbor’s side, or life is devoid of meaning. Our egoistic desire is not satisfied with what it has. As a result we suffer from the lack of an addition, and this addition must definitely grow as our egoism grows. Besides, our source is the Creator, who created us. He is the only, single, and irreplaceable one, and every one of us feels the same way. So where can we find fulfillment for someone who is so unique? That’s why it turns out that we never find satisfaction, not through pleasure, nor through the right self-realization. That is the nature of egoism. The smallest descent is enough for all of our heroism to vanish into thin air. We would agree to anything just to avoid feeling empty inside! The desire for pleasure depends entirely on the Light. As long as it receives Light, it is full of energy, even though it doesn’t understand where that energy comes from. But as soon as the Light grows slightly distant, you feel helpless and would agree to anything in order to correct the situation in some way. Look at the world: there’s terrorism, murder, theft, and lies. It would seem that if you gave every person what he wanted, no one would do anything bad. So who’s to blame? It’s the Creator, who does not reveal Himself and thereby evokes bad things. All that remains is to make the right conclusions from the above. Question: Would it be correct to say that the first stage is the unification between us and the formation of a spiritual vessel (Kli), while the second stage is the mutual guarantee? Answer: The mutual guarantee does not depend on us, but comes with the help of the Light. All the corrections and all the states are the result of the Light’s influence on the Reshimot (spiritual genes, reminiscences), but our readiness and desire for this to happen is for us to display. I open the book so as to facilitate the formation of a common desire whose quality will be bestowal. The Creator will be revealed within this common desire to the extent that it will bestow in accordance with the law of equivalence of form with the Creator. I don’t need to draw the Creator for Him to be revealed within my desire. I don’t need to forcefully reveal Him. I simply need to worry about the desire assuming the form of bestowal, and then the Creator will manifest. The law of equivalence of form already exists; it is the fundamental condition in nature. If this condition is met, the Creator becomes revealed. I only need to worry about my desires (Kelim, vessels). The Light is at absolute rest; we only lack the right desires, the qualities to perceive it. Therefore, my only task is to desire correction. I don’t actually perform the correction either; I merely give the Light the opportunity to correct me. This is why we gather together and think of the Light correcting us, meaning the connection between us. We want the Light to correct the breaking that took place in our roots. Then, because by thinking about this, we as though raise the Shechina (Divinity, our common soul) from the dust, we achieve spiritual revelation, the Creator, the Light of NaRaNHaY, which is 620 times greater than the original state before the breaking where there was only the Light of Nefesh. Question: If the Light builds desires (Kelim, vessels), then why do we remain in the same state of Infinity and only uncover it? Answer: In the process of expanding and descending from Above downward, the Light created all of the states of descent (the spiritual “rungs”) in such a fashion that the development or ascent is determined by the impact of the corresponding “rung” or spiritual degree on us, and not by the impact of the Light. The Light does perform actions, but solely if it is forced to do so. Herein lies the entire essence of the construction of the system of the Upper Worlds. The system was broken into parts in order to place obstacles on the path of the Light’s influence upon the desires so that specifically the need from the side of the desire would open the passage for the Light’s action. In the initial state, you and I reside in Infinity, but we don’t perceive each other since we are in different properties. The descent to this world is constructed from this condition so as to allow man to return to the Upper World on his own. In fact, the whole purpose of descending from Above downward lies in man’s independent ascent from below upward. A person doesn’t perform an act on his own, but evokes it by forming a desire for it. As soon as the desire to rise higher is formed, it triggers an ascent to the next rung. Thereby, a person discloses the previously concealed degrees. 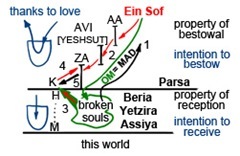 He seeks the forms of the will to bestow (the forms of bestowal to the Creator), and if the acquired form matches a higher spiritual degree, he evokes the forces of correction and ascends according to the principle: “Make your desire equivalent to His so that He may act as you desire.” Then, Zivug (spiritual coupling) occurs. Laitman.com Post: Knocked Off Or Pushed Forward On The Path? Question: I live in Ecuador. How, during the lesson, can I connect with the prayer for the correction of the group? Answer: A person has to try feeling as if he were here with us. There is no distance on the spiritual path. If one of us is sitting at the computer screen a few miles away from our center, another is somewhere in Ecuador, and still another is in our auditorium, it makes no difference. It all depends on where a person’s heart is. All you have to do is try to remain connected with us. A person is where his desire is. That’s because there is nothing else except the desire; the outer “clothing” doesn’t count. Question: How do I change my values? How do I place the importance of the Upper Force which constantly defines and forms me and my world above all material, animate, physical, and even human desires? How do I use the group, the environment, to raise it above everything that is important to the egoistic desire? Answer: It is specifically the importance that differentiates the egoistic desire from the spiritual desire to bestow. 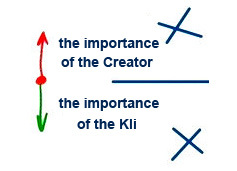 On the corporal level, it is concentrated on the Kli (vessel), while on the spiritual level, it is focused on the Creator. That is, what matters is where you focus your attention: on what you receive or from Whom you receive it. Importance can be switched over. For example, from a mother’s perspective, a child is more important than her. However, how do I follow her example regarding other people in such a diverse world? How do I convince myself to transfer the importance from my life to a certain force that paints this world for me? It’s worth remembering that I reveal this force by making an effort to examine it. I acquire the vessel of revelation. Now, the force is also present, but I am not focused on perceiving it. So, how do I focus my attention on it? Everything depends on importance. When it is focused on the Creator, I feel Him and live in Him. I can finally discern the things I did not notice before. The Creator Himself does not change. He remains at absolute rest. It is only the constantly operating Reshimot (reminisences, the spiritual genes) that make me make an effort. And later, I myself need to look for a way to focus these efforts on whatever really matters. This is where the environment comes to the rescue. Like glasses, it focuses my eyes on the essence. We unite, raise the importance of spirituality in our eyes, and focus our common efforts on a tiny point through which I begin to see the Creator. Mutual guarantee is a special space between us, our common desire. All spiritual revelations take place there. And if there is no such space, there is no common desire, but only our individual egoistic desires. We construct this common space to the degree that I annul myself and enter this collective desire, you annul and put yourself there as well, and so does everybody else. Otherwise, it does not exist! The vessel into which we can receive the Light is not ready-made; we have to build it, we have to aspire to oneness. By cultivating our unity, from 0 to 125 degrees, we perceive, at each degree, a new picture, a greater revelation of the Creator. All “sacred” books (the Torah, The Zohar, etc.) tell us exactly about this: the degrees of the connection we create by turning our evil and rejection of each other into love and unity. Thus, the entire Torah is comprised of stories that describe how we unfold and correct the evil. We feel our world in the “place of unification” as its absence; we feel our separation and not the Creator, the One. Yet, even this world resides in that very “place” between us with one difference: Here, we reveal the degree of our broken oneness and absence of the Creator. Meanwhile, unity acts similar to a resistor which connects plus and minus. Inside it, my ego, my rejection of all others, is concealed. But above it, I make an effort to unite. By doing so, I create resistance between rejection and exertion. And the greater the difference, the resistance between them (“faith above reason”), the greater Light is revealed. The same law applies to electronics and the spiritual world. Ultimately, all Nature consists of “plus” and “minus” or the forces of bestowal and reception. The only way to connect them together is through a resistor, which could be any receiver. This receiver is Adam that we are constructing: our soul.